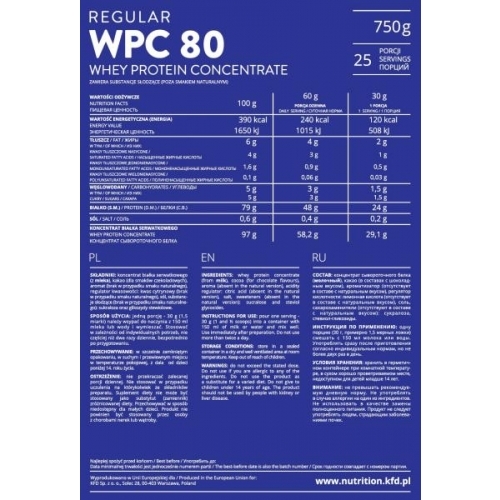 KFD Regular WPC 80 is a 100% pure whey protein concentrate. Delicate flavour and great mixability. Content of lactose and fat were reduced in the process of ultrafiltartion. There is no lactose left! KFD Regular WPC contains no aspartame or other additives (artificial colourings marked by „E” and fillers) which impact on the health nad body is questionable. Additional merit is lack of plant-based protein – like soy protein, wheat (known also as l-glutamine peptide), rice and other lower quality ingredients. KFD Regular WPC os a 100% pure whey concentrate with high BCAA (Branched-Chain Amino Acids) concentration. Our product does not contain any digestive enzymes (used in products by many American companies) which aim is to cover low quality of product filled with huge amounts - as for humans - of lactose which is the main sugar derived from milk. Whey protein concentrate provides a source of protein easy absorbed and broke down by human body, which makes it a perfect supplement for any sports enthusiast. When combined with suitable workout and diet, WPC improves muscle gains or body fat reduction. COMPOSITION / INGREDIENTS: Whey protein concentrate (from milk), cocoa (for chocolate flavours), aroma (not present in the natural flavor version), acidity regulator - citric acid (not found in the natural flavor version), salt, sweeteners - sucralose and steviol glycosides. INSTRUCTIONS FOR USE: Pour one portion - 30 g (1 and 1/2 scoops) into a container with 150 ml of milk or water and mix. Use immediately after preparation, according to individual needs and not more often than 2 times per day. STORAGE CONDITIONS: In a sealed container, in a dry and well ventilated area at room temperature, out of reach of children under the age of 14. Not to be consumed by children under the age of 14, pregnant women, people suffering from diseases of the kidneys or liver, with allergies to lactose, cow's milk protein or its derivatives.